The cost of filing for bankruptcy has risen in recent years as a result of the 2005 Bankruptcy Abuse Prevention and Consumer Protection Act, which aimed to reduce the number of bankruptcies taking place by adding more requirements to the filing process. NEW YORK (CNNMoney) -- This year, hundreds of thousands of Americans are expected to be too broke to file for bankruptcy. The average cost to file for Chapter 7 bankruptcy protection, the most common form of consumer bankruptcy, is more than $1,500, according to recent research submitted to the National Bureau of Economic Research. As a result, anywhere between 200,000 and one million consumers are estimated to be unable to afford that steep cost this year. The research, conducted by a group of professors from Columbia University, the University of Chicago and Washington University in St. Louis, examined how bankruptcy filings spiked after people received their tax rebates in previous years. They estimate that another 200,000 consumers, who would otherwise not have enough money to file, will use their tax refunds to pay for bankruptcy this year. "For lots of people, bankruptcy has been taken off the table as an option because of the severe fees involved," said Jialan Wang, co-author of the report. Among those fees is a charge of about $300 just for filing the paperwork with the federal court, while the rest typically goes to bankruptcy lawyers, said Wang. And there are other expenses on top of that, including fees for mandatory pre-bankruptcy credit counseling and a pre-discharge debtor education course. These average about $85 altogether, according to a recent study sponsored by the American Bankruptcy Institute. That means many of the Americans who have seen their debt snowball out of control due to events like job loss, foreclosure or a medical emergency during the economic downturn are now left without their last financial lifeline, she said. "It becomes harder and harder to pay off the debt as interest payments get higher, so your debt grows larger and larger," she said. The cost of filing for bankruptcy has risen in recent years as a result of the 2005 Bankruptcy Abuse Prevention and Consumer Protection Act, which aimed to reduce the number of bankruptcies taking place by adding more requirements to the filing process -- including additional paperwork and the credit counseling and debtor education. While the bankruptcy rate has fallen slightly since the law took effect -- from a rate of 1.4% in 2004 to 1.3% last year -- the average income of bankruptcy filers has increased, the NBER study found. The findings indicate that the new requirements are pricing out many of the consumers who are least able to afford the fees, said Wang. "It ends up being the relatively better off, or middle-class consumers who can actually afford to file, and the people with lower incomes can't afford to file," said Wang. Billy Brewer, president of the National Association of Consumer Bankruptcy Attorneys, said bankruptcy attorneys have no choice but to charge such high fees. 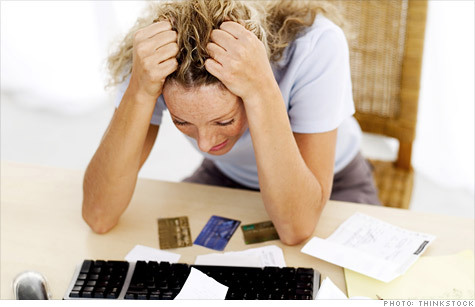 0:00 /2:01When should you file for bankruptcy? "When clients come in and I tell them the fee, they look at me like I have two heads, and say: What part of 'I'm filing for bankruptcy don't you understand?' But we can't afford to do it for free," said Brewer, who charges an average fee of $1,500. "Congress decided to make the process much more difficult and there's much more paperwork involved, so attorneys are spending double the time they used to just to help someone file." Those who can't afford the fees should still try to find a pro bono lawyer willing to provide legal services for free, said Wang. However, only a small fraction of people are actually able to get this kind of help. And think twice before you decide to go it alone, said Gerri Detweiler, director of consumer education for Credit.com. "It's too complicated now, and too much of a minefield. Make a mistake and your case is dismissed," she said. "A dismissed bankruptcy hurts your credit just as badly as one you complete. So you have all the downside without the fresh start." She also warns against low-cost document preparation services claiming to help consumers fill out necessary documents. It's easy for consumers to think they're getting sound legal advice even though the preparers aren't lawyers, she said. Among the various types of bankruptcy protection, Chapter 7 is the most common. Chapter 7 enables you to wipe out some or all of your debt in the shortest amount of time, said Detweiler. Bankruptcy doesn't relieve you of certain debts, however, like student loans or alimony payments. If you're filing Chapter 7 bankruptcy, you can request to have the $300 court fee waived. The judge will typically grant a waiver if your income is less than 150% of the poverty line and you can prove that you are unable to pay the fee in full or in installments. However, it's the attorney fees that are the biggest expense. If you have been making some payments on your debts, an attorney may advise you to stop paying creditors, which can free up the money you need to pay the attorney's fees. But if you haven't had enough money to make any payments to creditors, Detweiler recommends asking friends or family members for help. If that doesn't work, you could sell some of your belongings or get a second job, as long as your attorney says that it wouldn't affect your ability to receive bankruptcy protection. Brewer, of the National Association of Consumer Bankruptcy Attorneys, said sometimes it's just a matter of rearranging priorities. "If the need is crucial enough, consumers usually find a way to come up with the money," he said.